A freshly painted door not only brightens up a room, it can also make a hallway look cleaner and more inviting. To get the best results the next time you're painting a door, check out this quick tutorial. Considering the low cost of the project and the relative ease with which it can be completed, painting a door is a terrific way to add a punch of personality to any interior. Painting a door involves virtually no risk: If you decide to paint the door orange, let’s say, and you end up hating how it looks, no problem: You can always revert to the original color or experiment with a different one. That said, painting a door is different from painting other surfaces. It requires more planning, a slightly modified approach, and a few supplies you might not have anticipated. Follow the steps below, however, and you ought to encounter few difficulties. If you’ve painted before, you’re most likely familiar with the idea that proper surface preparation means the difference between a smooth, lasting, beautiful finish and a sloppy-looking job. Satisfying, professional-level results begin with sanding, which goes a long way toward ensuring that the paint readily sticks to the door. Use 120-grit sandpaper and either manually, or by means of a hand-held power sander, sand the surface of the door in the direction of the wood grain. Once finished, wipe down the door with a lint-free tack cloth dampened with mineral spirits. Doing so removes the dust and oils that can interfere with paint adhesion. Of course, the presence of hardware—that is, hinges and knobs and perhaps a locking mechanism—spells the crucial difference between a door panel and a wall of plaster or gypsum board. Avoid getting any paint on the door hardware, not only for aesthetic reasons, but also because you might disturb the hardware’s functioning. The safest course is to remove the knob and lock—or to completely remove the door from the hinges—before you start painting in earnest. For those looking to avoid that sort of hassle, a decent compromise would be to protect the metal parts of the door with strategically positioned painter’s tape. Paint the frame of the door (also known as the casing) first—assuming you want to—so that any errant brush strokes land on the door panel that you’re going to paint anyway. If you do choose to paint the frame, use a one- or two-inch brush and let the coat dry completely before you proceed any further. That way, you won’t have to tread carefully later on, fearing that your next movement might result in an unsightly smudge. Are you painting a door with inset panels? If so, paint those before the rest of the door. As you did with the door casing, use a one- or two-inch brush for this round of detail work. Your goal is to get these more-demanding aspects of the job out of the way, so you can then speedily finish with a roller. A roller not only enables you to work faster, but it also delivers a smoother finish. As you go, remember to blend in any brush marks created in earlier steps. To avoid leaving fingerprints, it’s smart to paint one side of the door, let it dry completely, and then go on to paint the edge of the door and the opposite side. A word to the wise: While the paint is drying, minimize imperfections by keeping pets and children away from the door. Replace any hardware you’ve removed only after the paint is fully dry. 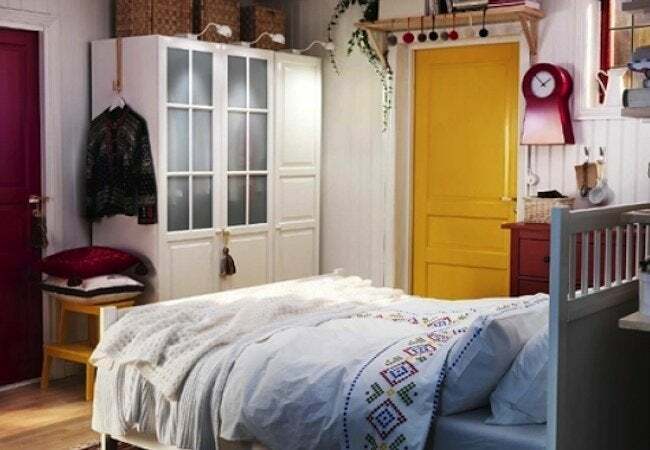 Finally, step back and marvel at what a difference a painted door can make!